Background: Hypoxia induces the release of nucleated red blood cell (NRBC) from marrow storage pool to peripheral circulation of asphyxiated infants. Evaluation of NRBC may have reasonable predictive ability for diagnosing perinatal asphyxia. Methods: A diagnostic study was conducted in a tertiary care hospital enrolling 50 asphyxiated cases and 50 healthy controls. NRBC level/100 white blood cell (WBC) was calculated for all infants within first 6 h of life. Receiver operating characteristic (ROC) curve was constructed to select threshold values. Sensitivity, specificity, and positive and negative predictive values (PPV and NPV) were also calculated. Results: The mean NRBC count/100 WBC for cases was 20.3 ± 8.9 compared to 3.8 ± 1.3 for controls (P < 0.001). NRBC cutoff of >9/100 WBCs has 96% sensitivity, 94% specificity, 94% PPV, and 95% NPV in predicting perinatal asphyxia with area under ROC curve 0.98. Positive likelihood ratio was 16, and negative likelihood ratio was 0.04, with 95% overall diagnostic accuracy. Conclusion: NRBC level could predict perinatal asphyxia with reasonable accuracy. Perinatal asphyxia is a major cause of mortality and long-term neurodevelopmental impairment in developing nations. No single marker has shown good predictive ability for diagnosing perinatal asphyxia. Only, a combination of various indices can help in the early diagnosis of perinatal asphyxia. Nucleated red blood cells (NRBCs) are primarily produced in the fetal bone marrow in response to erythropoietin and are stored in the marrow as precursors to reticulocytes and mature erythrocytes. The number of NRBC/100 white blood cell (WBC) is variable but is rarely >10 in normal neonates. The hypoxic event induces a compensatory response in the form of exaggerated erythropoiesis, resulting in the release of immature red blood cells into the fetal circulation. NRBC count in umbilical venous blood of neonates has been reported as a possible marker of perinatal asphyxia., The present study is intended to evaluate the diagnostic accuracy of NRBC/100 WBC in venous blood for prediction of perinatal asphyxia. This diagnostic study was undertaken between June 2012 and August 2013, in the Neonatal Intensive Care Unit (NICU) of a tertiary teaching hospital in Southern India. The sample size of 79 was calculated; taking expected sensitivity 83% and specificity 73%, based on a previous study, the prevalence of perinatal asphyxia 3/100 live births at our institution with desired precision 10% and confidence level of 95%. Assuming an attrition rate of 20%, total 100 consecutive series of inborn term newborns (>37 weeks gestation) were prospectively enrolled for the study (50 cases with asphyxia and 50 healthy control infants) after obtaining informed consent from parents. The study was approved by the Institutional Ethical Committee. The infants eligible for the study had gestational age of ≥37 weeks and had perinatal asphyxia as manifested by all of the following four diagnostic criteria (1) a sentinel hypoxic event occurring immediately before or during labor (2) failure to initiate breathing or Apgar score <7 at 1 min (3) need for resuscitation at birth (positive pressure ventilation or chest compression), and (4) early-onset features of hypoxic-ischemic encephalopathy (HIE). Preterm infants, infants with life-threatening congenital anomalies, small for gestation age (SGA) infants (birth weight <10th centile), and those with Rh or ABO isoimmunization were excluded from the study. The asphyxiated infants were treated as per the routine NICU treatment protocol for perinatal asphyxia. Therapeutic hypothermia was not routinely used as a standard of care for the treatment of asphyxia in our unit during the study. The baseline demographic details were collected, and clinical assessment, including structured neurological examination and staging of HIE, was done serially during the hospital stay and at discharge. All babies were followed up until discharge from the hospital. In addition to the routine NICU protocol investigations for asphyxia, an additional 2 ml of peripheral venous blood was collected within 6 h of life from all infants to determine the NRBC count. For healthy infants, an additional 2 ml of blood was collected for NRBC during routine sampling for blood group and Rh typing after parental counseling and informed consent. NRBC count was determined manually after making a thin blood smear using Leishman stain. The investigators were not blinded to the index test or clinical information available. All statistical methods including descriptive statistics, Chi-square/contingency coefficient analysis, independent samples t-test, Pearson correlation coefficient, and Spearman rank correlation coefficient were carried out by SPSS (version 19.0, IBM Corp., Armonk, N.Y., USA). 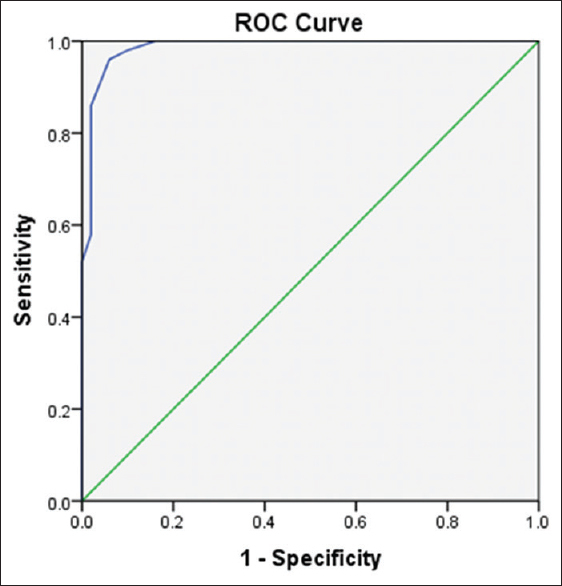 Receiver operating characteristic (ROC) curve was constructed to permit the selection of threshold values and comparison of different testing strategies allowing the calculation of sensitivity, specificity, positive and negative predictive values (PPV and NPV), positive and negative likelihood ratios (PLR and NLR), and overall diagnostic accuracy. P < 0.05 was taken as statistically significant. 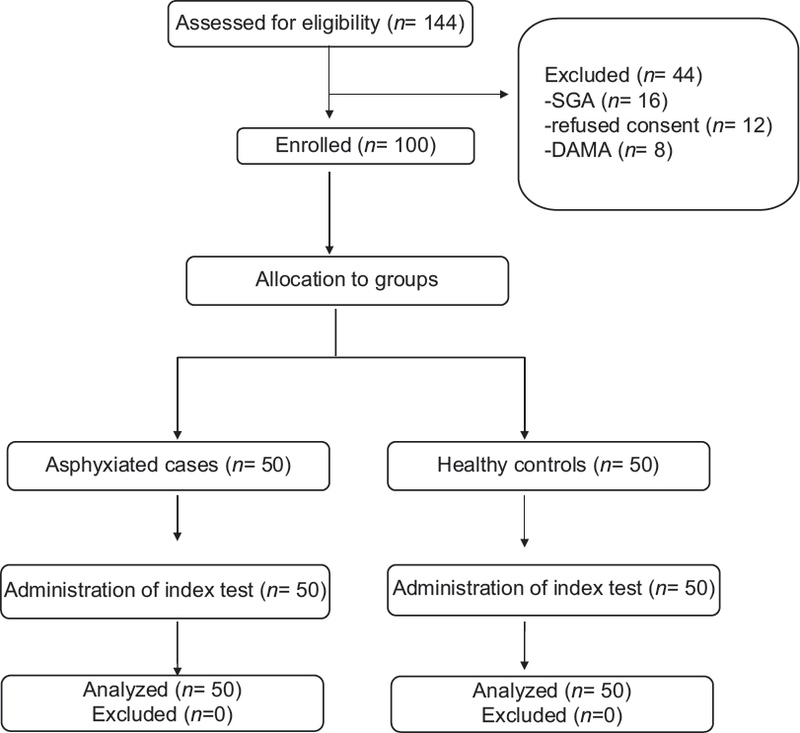 Of total 144 infants enrolled, after excluding 44 infants (16 SGA,12 refused consents, eight discharged against medical advice, four life-threatening anomalies, and four isoimmunizations), the remaining 100 infants (50 cases with asphyxia and 50 healthy controls) were included in the study [Figure 1]. The baseline demographic features of cases and controls were comparable [Table 1]. 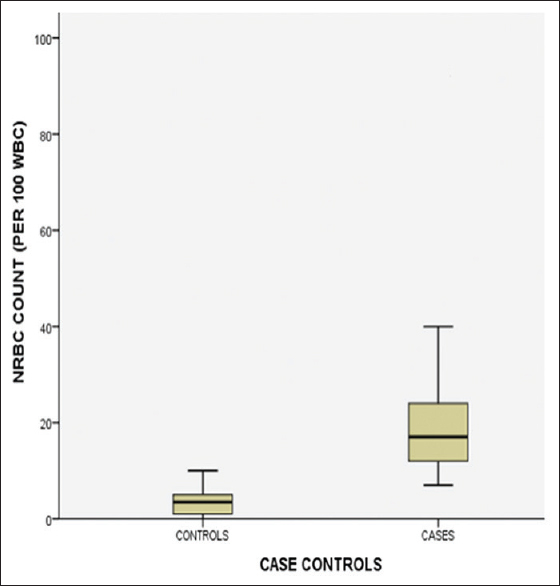 The mean NRBC count/100 WBC for cases was 20.3 ± 8.9 as compared to 3.8 ± 1.3 for controls. NRBC count was higher in cases compared to controls which was statistically significant (P < 0.001). The same is demonstrated in [Figure 2]. NRBC count was compared with the severity of HIE using one-way ANOVA analysis. The mean NRBC count was 11.33 ± 3.2 in Stage 1, 21.85 ± 12.3 in Stage 2, and 25.92 ± 8.0 in Stage 3 HIE. NRBC count increased with increasing severity of HIE which was statistically significant (P = 0.031). NRBC count cutoff of >9/100 WBCs has sensitivity of 96% (95% confidence interval [CI], 90–100), specificity of 94% (95% CI, 87–100), PPV of 94% (95% CI, 87–100), and NPV of 95% (95% CI, 90–100) in predicting perinatal asphyxia with area under ROC curve 0.98 [Figure 3]. PLR was found to be 16 (95% CI, 5.3–47.9), NLR was 0.04 (95% CI, 0.01–0.16), with an overall diagnostic accuracy of NRBC 95% (95% CI, 90–99) [Table 2]. There were a total of eight deaths in this study. All deaths occurred in the cases with NRBC count 20 and more. About 47% of cases with NRBC count of 20 or more died. This group had a significantly longer hospital stay compared to other group (P = 0.001). In the present study, we found that the mean NRBC/100 WBCs were significantly elevated in asphyxiated infants compared to healthy infants. NRBC count was found increasing proportionately with increasing severity of HIE. Prematurity, ABO and Rh isoimmunization and SGA were reported as a cause of increased NRBC count and hence excluded from the present study., All baseline clinical characteristics of both asphyxiated cases and healthy control infants were comparable. The mean gestation age was 39.8 weeks and 39.3 weeks for cases and controls, respectively. Although the rise of NRBC in asphyxia has been reported in the previous studies,,,, the diagnostic accuracy of NRBC in perinatal asphyxia and predictive ability of NRBC for severity of HIE are less reported in literature. In the present study, we found that NRBC count cutoff of >9/100 WBC has a sensitivity of 96%, specificity of 94%, PPV of 94%, and NPV of 95% in predicting asphyxia. Ferns et al. reported the similar significant difference in the NRBC count between cases and controls and between various stages of HIE (P < 0.000). Phelan et al. showed that neonates with neurological impairment secondary to perinatal asphyxia had a significantly higher number of NRBC than the control group (P < 0.001). Fotopoulos et al. reported that increase in the number of NRBC is an early marker for subsequent neurological impairment, although the study was done in low-birth-weight infants. Boskabadi et al. conducted a prospective case–control study in which 42 asphyxiated infants were compared with 49 healthy control infants. This study found that for an absolute NRBC count of >70/mm3; the sensitivity and specificity for the diagnosis of perinatal asphyxia were 83.4% and 73.5%, respectively. NRBC counts were found to be 3.87/100 leukocytes for healthy infants, 9.75 for asphyxiated neonates without HIE, 11.94 for HIE Grade 1, 21.08 for HIE Grade 2, and 29.18 for HIE Grade 3. The difference in definition of asphyxia, variation in cutoff and calculated unit might have made a difference in sensitivity and specificity. The evaluation of pH and base excess for asphyxia was not done in the present study due to our institutional logistic difficulties. Due to lack of expertise and low-resource setting, we were not routinely practicing therapeutic hypothermia for perinatal asphyxia during the study. Further studies may throw light on the alterations in NRBC levels in asphyxia for infants undergoing cooling. The analysis of the predictive ability of NRBC in short-term neurological abnormality is underway, and hence, not reported in the present study. Long-term follow-up data may further provide insights to the predictive ability of NRBC in future neurodevelopmental impairment. In the present study, we found that NRBC level can predict perinatal asphyxia and severity of HIE with reasonable accuracy. It may result in further research regarding the utility of NRBC as an additional diagnostic criterion of perinatal asphyxia or selection of infants for therapeutic hypothermia. The relevance of NRBC may be more in such resource-limited setting where most deliveries occur out of the hospital, and the diagnosis of asphyxia and HIE is in doubt. The relative ease and low-cost technique of measuring NRBC level may make it relevant in the context of developing countries. The authors would like to thank Dr Richa Sharma PhD, Postdoctoral Research Associate, Boston University Medical Center, Boston, Massachusetts for immense help with her guidance, proof-reading and statistical analysis and also all our patients and parents for their kind cooperation with the research proceedings. The authors would like to extend our gratitude to all faculty of the Department of Hematology for assisting us in the research. Ferber A, Fridel Z, Weissmann-Brenner A, Minior VK, Divon MY. Are elevated fetal nucleated red blood cell counts an indirect reflection of enhanced erythropoietin activity? Am J Obstet Gynecol 2004;190:1473-5. Phelan JP, Ahn MO, Korst LM, Martin GI. Nucleated red blood cells: A marker for fetal asphyxia? Am J Obstet Gynecol 1995;173:1380-4. Ghosh B, Mittal S, Kumar S, Dadhwal V. Prediction of perinatal asphyxia with nucleated red blood cells in cord blood of newborns. Int J Gynaecol Obstet 2003;81:267-71. Buonocore G, Perrone S, Gioia D, Gatti MG, Massafra C, Agosta R, et al. Nucleated red blood cell count at birth as an index of perinatal brain damage. Am J Obstet Gynecol 1999;181:1500-5. Sarnat HB, Sarnat MS. Neonatal encephalopathy following fetal distress. A clinical and electroencephalographic study. Arch Neurol 1976;33:696-705. Green DW, Mimouni F. Nucleated erythrocytes in healthy infants and in infants of diabetic mothers. J Pediatr 1990;116:129-31. Baschat AA, Gungor S, Kush ML, Berg C, Gembruch U, Harman CR, et al. Nucleated red blood cell counts in the first week of life: A critical appraisal of relationships with perinatal outcome in preterm growth-restricted neonates. Am J Obstet Gynecol 2007;197:286.e1-8. Hanion-Lundberg KM, Kirby RS, Gandhi S, Broekhuizen FF. Nucleated red blood cells in cord blood of singleton term neonates. Am J Obstet Gynecol 1997;176:1149-54. Hermansen MC. Nucleated red blood cells in the fetus and newborn. Arch Dis Child Fetal Neonatal Ed 2001;84:F211-5. Maier RF, Böhme K, Dudenhausen JW, Obladen M. Cord blood erythropoietin in relation to different markers of fetal hypoxia. Obstet Gynecol 1993;81:575-80. Ferns SJ, Bhat BV, Basu D. Value of nucleated red blood cells in predicting severity and outcome of perinatal asphyxia. Indian J Pathol Microbiol 2004;47:503-5. Saraçoglu F, Sahin I, Eser E, Göl K, Türkkani B. Nucleated red blood cells as a marker in acute and chronic fetal asphyxia. Int J Gynaecol Obstet 2000;71:113-8. Phelan JP, Korst LM, Ahn MO, Martin GI. Neonatal nucleated red blood cell and lymphocyte counts in fetal brain injury. Obstet Gynecol 1998;91:485-9. Fotopoulos S, Pavlou K, Skouteli H, Papassotiriou I, Lipsou N, Xanthou M, et al. Early markers of brain damage in premature low-birth-weight neonates who suffered from perinatal asphyxia and/or infection. Biol Neonate 2001;79:213-8. Boskabadi H, Maamouri G, Sadeghian MH, Ghayour-Mobarhan M, Heidarzade M, Shakeri MT, et al. Early diagnosis of perinatal asphyxia by nucleated red blood cell count: A case-control study. Arch Iran Med 2010;13:275-81.